It’s time to dust off the old swimsuit… the weather’s heating up that means fruit juice, salt water, tanned skin and sandals. Ahhh, summer! Our favourite time of year. Survive this season in style with these 5 must-have accessories, so you can get back to blissfully enjoying a weekend away at the beach. As far as we’re concerned, you should always go bold or go home with your swimmers! Plain triangle bikini’s are a thing of the past – this season, it’s all about one piece’s and halter styled bikinis. We’re loving retro 90s prints like bold checkers, trippy patterns and yin yang prints. Pick the piece that speaks to you and make a splash! A good beach towel is one you’ll be carting around on beach adventures for years. You’ll want one that’s big enough for two people to sit on, or one person to lie on with room to spare (no one likes a sandy face). 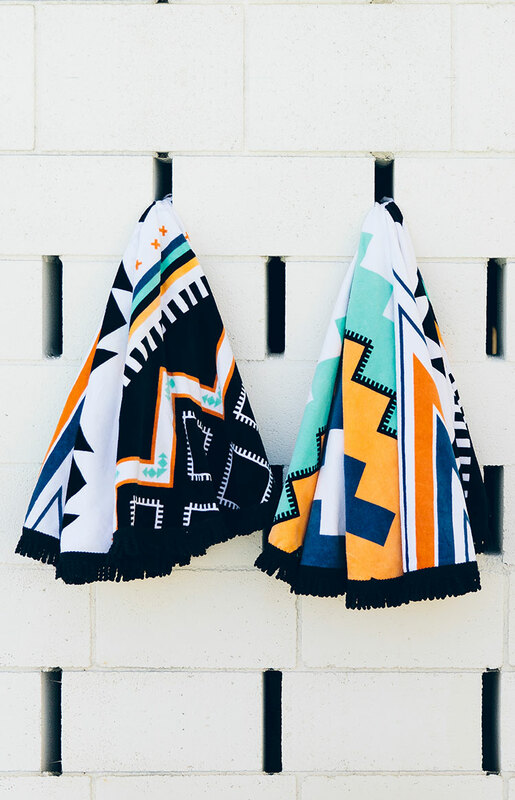 Best of all, it can double as a picnic blanket or a couch throw which makes it practically perfect for festivals, the beach, picnics, or any road trip! We’re totally obsessed with The Beach People round towels – definitely the accessory of the season. For the best UV protection, pick something with category 3 lenses or something polarised for glare. Which shape should you get? Oval face shapes suit most styles, square face suit curvier frames, round faces should try geometric shapes and heart-shaped faces should rock slim frames with curved bottoms. 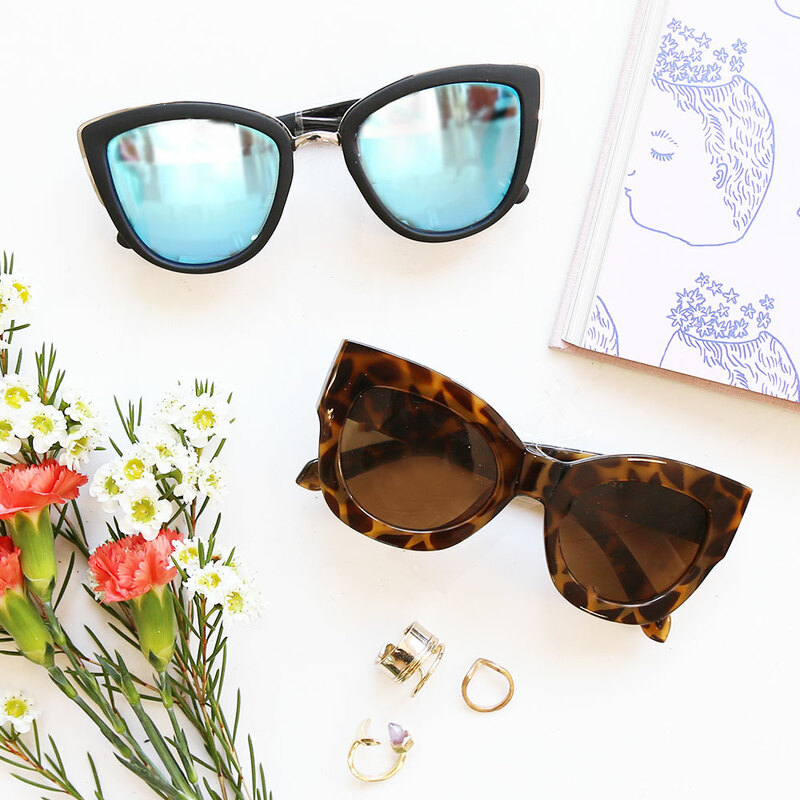 We recommend tortoiseshell frames for blondes and black frames for brunettes. Don’t forget a good case so you can protect your new baby! The wide brim hat is back and is here to complete your outfit! Boho babes will totally love a floppy hat, or go for a structured fedora for an edgier piece. We’re a big fan of felt or wool hats because they always bounce back into shape so you don’t have to be as careful with them. Stick to a neutral colour that’ll match your summer wardrobe so you can rock your hat just about everywhere! We hate to say it, but the only healthy tan is a fake tan! Protect your skin instead of frying it this summer, invest in a good sunscreen, great tanner and exfoliator and make a Sunday evening ritual. Your friends will never know the difference and your 80-year-old self with thank us. Feeling inspired? Shop our summer accessories right here. Raspberry Ripple Bars by our #bbhealthyrecipe winner!